The Andhra Pradesh Road Development Corporation (APRDC) is importing vehicles for making an assessment of nearly 41,000 km of Roads and Buildings Department with the financial assistance of the World Bank. 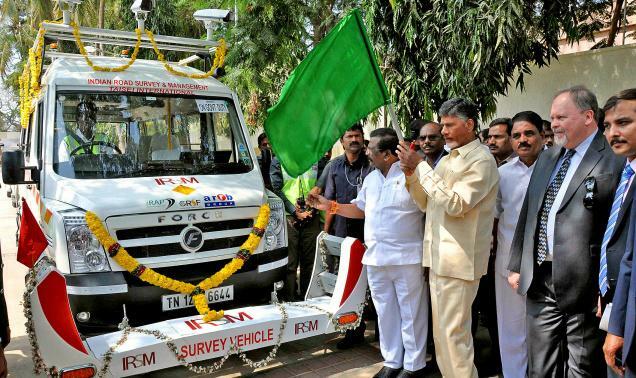 Chief Minister N. Chandrababu Naidu flagged off multi-purpose high technology network survey vehicles at his camp office here on Wednesday. Fitted with Hawkeye equipment and imported from Australia, the vehicles can collect high quality data for functional and structural evaluation of roads. On the occasion, Mr. Chandrababu Naidu said the initiative was taken to create a quality data base of the condition of roads and the project was entrusted to Australian Road Research Board (ARRB) which did pioneering work in the area of road condition monitoring. It will get the data collected by a joint venture company over the next six months. The Hawkeye portable devices will help in road-profiling and video data collection. The equipment makes routine pavement monitoring surveys, roadside inventory and asset management and road safety assessment. Australian Consul General to South India Sean Kelley and Andhra Pradesh Transport Minister Siddha Raghava Rao were among those present.